Mike Neary and I presented a conference paper today at the Co-operative Education conference. You can find it on this page. We’d really appreciate comments on the framework we have developed in the paper and is illustrated below. Framework for Co-operative Higher Education. Design by Sam Randall, student at University of Lincoln. The paper has also been accepted for the 2016 International Co-operative Alliance research conference in Almeria, Spain (May 24-27th). The paper will also be presented at the Universities in the Knowledge Economy (UNIKE) conference, Copenhagen, Denmark (14-17th June). 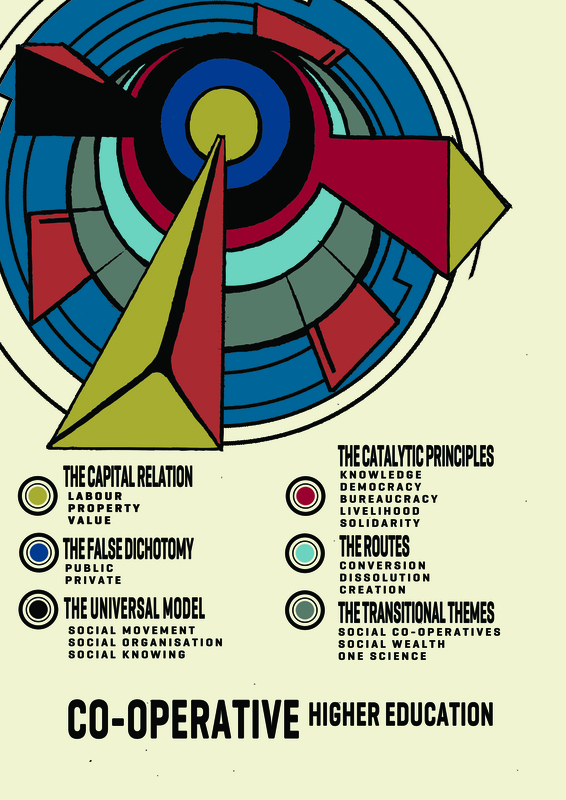 Framework for Co-operative Higher Education (click to enlarge). Design by Sam Randall, student at University of Lincoln. We will discuss the design of the research project, the widespread interest in the idea of co-operative higher education and our approach based on the collaborative production of knowledge by academics and students (Neary and Winn, 2009; Winn 2015). The main findings of the research so far will be outlined relating to the key themes of our research: pedagogy, governance, legal frameworks, business models, and transnational solidarity. We will consider how these five themes relate to three identified routes to co-operative higher education (conversion, dissolution, or creation) and argue that such work must be grounded in an adequate critique of labour and property i.e. the capital relation. We will identify both the possible opportunities that the latest higher education reform in the UK affords the co-operative movement as well as the issues that arise from a more marketised and financialised approach to the production of knowledge (HEFCE, 2015). Finally, we will suggest ways that the co-operative movement might respond with democratic alternatives that go beyond the distinction of public and private education. HEFCE (2015) Operating Framework for Higher Education. OECD (2015) Education at a Glance 2015. Social Science Centre (2013) An experiment in free, co-operative higher education. Radical Philosophy, 182. Winn, Joss (2015) The Co-operative University: Labour, Property and Pedagogy, Power and Education, 7 (1) 39-55. This workshop will focus on the theory and practice of higher learning in the context of the co-operative movement. We will ask participants to consider ‘co-operative learning’, not as the practice of ‘positive interdependence’ but as a form of negative social critique that moves us towards the production of practical-critical knowledge for a post-capitalist society.